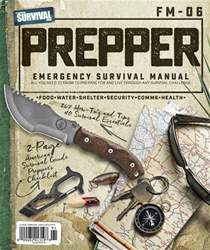 Twice a year, the American Survival Guide team publishes our Prepper Emergency Survival Manual. This spring/summer 2019 issue focuses on general preparedness and survival information, as well as critical facts and advice that directly relate to what you need to know during the warmer months of the year. There are more than 250 tips and suggestions, as well as some useful product recommendations, so we trust you’ll find plenty of informative and actionable material that will help you eff ectively and efficiently prepare for emergencies and other challenging scenarios in the coming months.